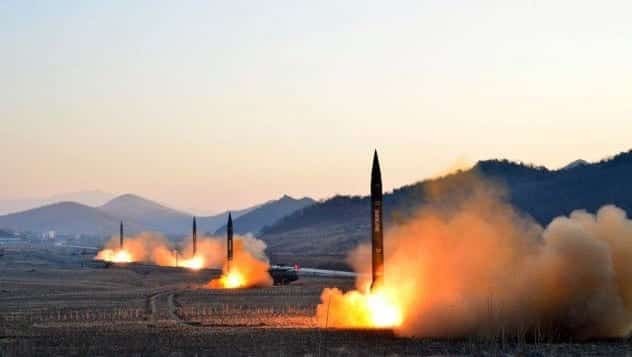 According to South Korea’s military reports North Korea fired what looked like several land-to-ship missiles off its east coast Thursday, which flew about 124 miles. The missiles were launched from Wonsan, South Korea’s Office of Joint Chiefs of Staff said in a statement, and South Korean President Moon Jae-in has been briefed. This is North Korea’s fourth missile test since Moon took office in mid-May; the country has recently tested ballistic missiles, medium-to-long range missiles, and a short-range Scud class weapon. North Korea is refusing to give up its nuclear and missile program, despite new U.N. sanctions passed against the country last week, saying the weapons are necessary due to U.S. aggression. BREAKING: South Korea's military: North Korea fires several projectiles believed to be short-range surface-to-ship cruise missiles. This entry was posted on June 8th 2017 at 10:20am/10:20 and is filed under Live News Column 1, Politics, World News. You can follow any responses to this entry through the RSS 2.0 feed.